Could this be the hip-hop album of the year?? Excuse me, but is that your girl? New York indie rock ninjas TV On The Radio have been making great music since 2001. Like many people, however, I only stumbled across them with the release of their fourth, and best, LP Dear Science a couple of years ago. Critics generally put Dear Science's success down to two things: Dave Sitek's generous, multi-layered production, and a serious dose of "da fonk". In other words, TV On The Radio had made indie music you could dance to. In yet more other words, they'd stumbled across the holy grail of not-crap guitar bands: Decent songs. Then Dave Sitek went off to sprinkle his magic dandruff over the Yeah Yeah Yeahs' It's Blitz! (amazing) and released a solo album under the name Maximum Balloon (doubly amazing). There were rumours the band had split up... rumours which they did little to dispel. Then suddenly, out of nowhere, a new song popped up. 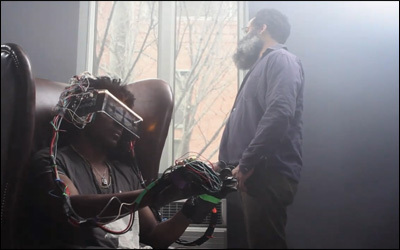 The video for Will Do features the band strapping on virtual reality headsets to play virtual reality instruments. It is all very impressive, in a "didn't we stop talking about virtual reality in 1992?" 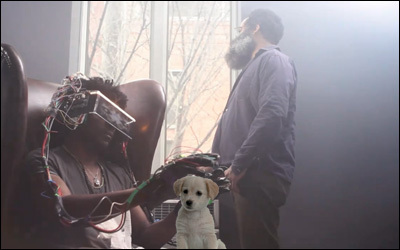 kind of way, but they have stupidly missed an obvious promotional opportunity: Virtual reality puppies. Am I wrong or am I wrong? I am not wrong.